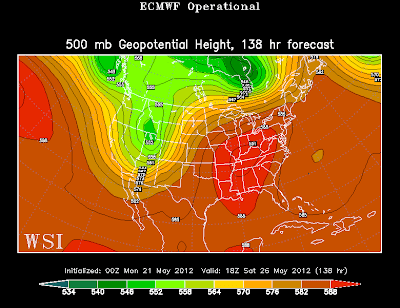 All indications are pointing to a hot, humid Memorial Day weekend for the Ohio Valley including southeast Missouri, Illinois, southern Indiana, Kentucky and Tennessee thanks to an upper level hot-dome taking residence as seen in the computer model image. Above is the European Agency's forecast model looking specifically at the 500mb level (approximately 18,000 feet) for Saturday afternoon. It's Going to Be Hot!